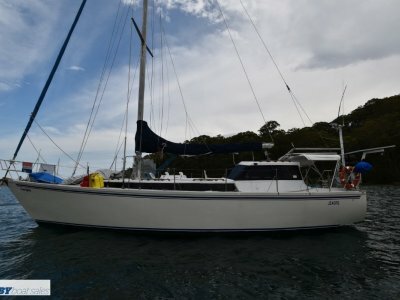 1990 Hylas 44 for sale. Laros is a Hylas 44 built by Queen Long Marine Yard Taiwan in 1990. She was imported by her original owner into UK in 1991, and has since had 4 subsequently owners. 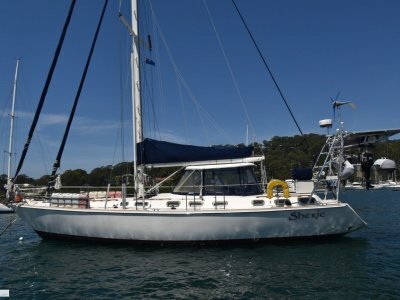 The current owners bought her in Lymington UK in 2013, and after an extensive refit, sailed her to Australia over 3 years via the Mediterranean, Caribbean, Panama, Tahiti, Tonga, Fiji, and New Zealand. 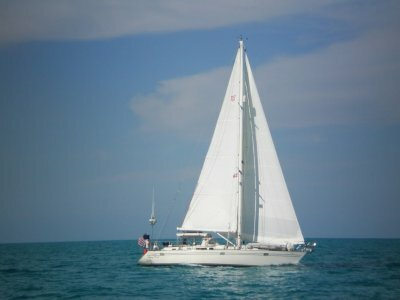 She is built and equipped for blue water sailing including extensive safety gear and navigational equipment. Designed by German Frers who introduced the redesign of Hallberg Rassy yachts in 1994, she is a fast but sturdy GRP monohull having completed the Atlantic Rally for Cruisers (2840 Nm) in 18 days 23 hours, coming 14th overall in the Cruiser Division (c140 yachts). Antifoul is Coppercoat applied in 2013 (expected lifespan 10+ years). Her keel is GRP encapsulated lead ballast with a full length skeg hung rudder. She has a centre cockpit with teak laid cockpit seating and sole and all round bimini canvas and cockpit cushions providing extensive all weather protection. Her main engine is a Yanmar 4JH-TE 55hp turbocharged driving a 2 blade folding propeller, with 280 litres diesel fuel tanks. She has Eberspacher cabin heating. Below decks, she comprises 3 cabins sleeping 4-6 persons. Her master state stern cabin has 2 single sprung mattresses forming a pedestal double bed, with curved settee, dressing table, side tables and 2 hanging lockers. The master en-suite comprises vanity and separate shower/toilet (with holding tank) compartments. 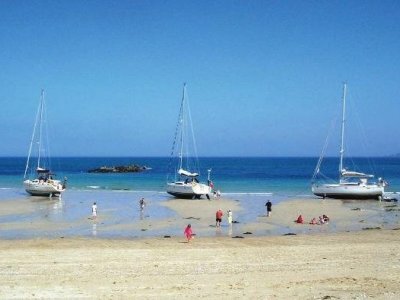 The guest accommodation comprises a twin V-berth with infill cushion, hanging locker and en-suite with shower. The main saloon has settee and table seating for 6, with 2 tub chairs, bookshelves and lockers storage. A separate navigation station with half folio storage chart table completes the accommodation below. The interior is fitted out in teak veneered marine ply with teak and holly inlaid cabin sole boards. Builder : Queen Long Marine yard, Taiwan. Keel/Ballast : GRP encapsulated lead ballast with full-length skeg hung rudder. Number of Helms : Edson pedestal wheel cable steering system incorporating Rigel Poseidon compass. Hydrovane wind steering system. Number of Batteries : 2 x Varta/ Branded 220ah deep cycle house batteries. 3 x Varta 60/72ah engine and windlass batteries. Accommodation Notes : Master state cabin has 2 single sprung mattresses forming a pedestal double bed, with curved settee, dressing table, side tables, 2 hanging lockers. Guest accommodation - twin V berth with infill cushion, hanging locker and ensuite with shower. Main saloon has settee and table seating for 6, with 2 tub chairs, book shelves and locker storage. Separate navigation station with half folio storage chart table. Interior fitted out in teak veneered marine ply and holly inlaid cabin sole boards. Shower Type : Hot and cold pressurised. 25L hot water cylinder (engine and 240v element heated). Air Conditioning : Electric Caframo fans in all cabins. Eberspacher cabin heating. Galley Notes : Fresh and salt water pumps to sinks. AEG Micromat Duo microwave. Various kettles, fry pan, toaster. Pans, cooking utensils, crockery, cutlery and plastic ware. Stove : Force 10 3 burner + oven + grill. Refrigeration : Grunert salt-water cooled system. 2 x 2.5 cubic ft fridge/ freezer compartments with top and front access doors. Entertainment and Appliances Notes : Wall mounted TV and 4 speaker USB stereo. Anchor / Winch : 10 x Barient model 22-32 self-tailing/ NST winches. Maxwell ST 1500 electric windlass. Bilge Pump : 3 x Jabsco 12v water pumps - water, shower, bilge. 1 x Whale bilge/ sump manual gusher pump. Deck Gear : Double wire life lines with boarding gates. Magma gas BBQ. S/S transom mounted swim ladder. Deck shower - H & C.
Mast/Rigging : Bermuda rigged sloop, through deck masted yacht with temporary inner forestay for storm sail. Standing rigging replaced 2015. Running rigging in good condition. Spars - Proctor anodised aluminium white painted, including a mast-stowed spinnaker pole and Kemp rod boom vang. Double lifelines incorporating solid rail pulpit, pushpit, quarter deck rails, and gantry with rigging for dinghy lift and stowage. 2 x capshroud stays, 4 x inner shroud stays, babystay, backstay with HF antenna isolators. Forestay mounted Schaefer headsail furling gear. Running backstays. Harken mainsheet and Genoa car track system. Sail Inventory : 1 x Hood 135% heavy # 1 Genoa. 1 x Branded 135% light # 1 Genoa. 1 x Branded 105% light # 3 Genoa. 1 x Branded Storm sail. 1 x Hood Main sail. Full-length sail pack with lazy jacks and mast/ head cover. 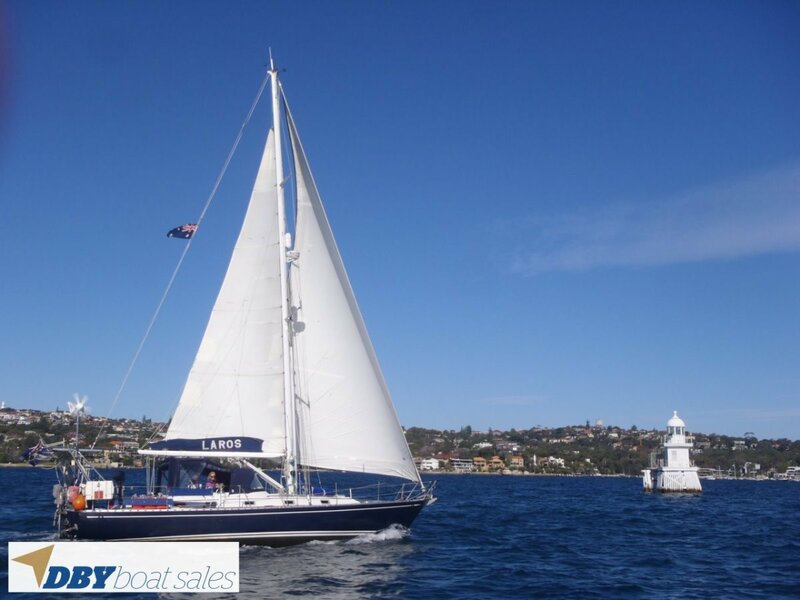 Electrics : 12v DC and 230v AC 50hz circuits throughout, powered by engine alternators, 7kva marine generator, solar panels and wind generator. Lighting including navigation lights are LED. Engine driven 55amp and 115 amp generators. SET-Zeise 6kvA marine generator. Marlec wind generator gantry mounted. Marlec HRDi charge regulator. BigBoy wifi booster router and antenna. Electrical panel incorporating AC/ DC meters, DC/ AC and engine switch and controllers. Sterling Power digital inverter Pro Power Q 12/24v 350w. Xantrex Truecharge 2,40a battery charger. Shore power cables and adaptors. Electronics Navigation : Extensive upgrade in 2013. Raymarine instruments - a70 Chart Plotter, AIS 350/650 Class B transceiver, 18 inch digital radome scanner, ITC 5 Converter. SmartPilot ST6001 controller and display, driving B & G hydraulic quadrant ram. NMEA backbone incorporating e125 Hybrid Touch master Chart Plotter. Second Chart Plotter. Multi-function instrument display and Autopilot. Raymarine HD radar and AIS. Hydrovane wind-steering system fitted in 2015. FCC Precision quartz clock and barometer. Dinghy : Avon 2.7m Rover inflatable dinghy and oars, with electric and foot pumps. Mercury 5hp 2 stroke outboard with rail mount. Covers : Bimini, full boat heavy canvas. Safety Gear : To ARC Standard. GME EPIRB Class 2 water activation. Ocean safety RORC flare pack (Solas 74/96) Avon 6 person liferaft (canister stern rail mounted/ not in service). Firdell Blipper radar reflector. Sowester MOB Recovery system. RORC Danbuoy. 2 x Jackstays. Plastimo horseshoe lifebuoy with signal beacon. Ecoblast rechargeable signal air horn. Quartz halogen hand held spotlight (mains 12v) Ocean safety first aid kit. Grab Bag. 4 x cabin fire extinguishers, 1 x auto ER fire extinguisher. 2 x Spinlock life vests, 2 x Kru Sport Pro ISO life vests, with harnesses. Ground Tackle : 45lb CQR anchor with 60m chain. Danforth sand anchor. Radio : VHF - Raymarine 54e DSC marine radio. ICom IC-M91D handheld VHF with GPS. ICom 802 MF/HF marine radio with Pactor modem. Pactor modem controller SCS PTC-lipro with PTC software.